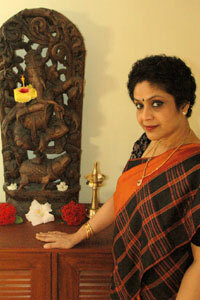 Dancer, choreographer, writer, scholar and cultural commentator, Dr. Ananda Shankar Jayant, with an intense body of artistic work that spans rich mythologies and historical chronicles, searing commentary on gender issues, as well as secular and philosophical presentations, continues to stretch the outer realms of artistic endeavor, using the grammar, idiom and space-time construct of Bharatanatyam and Kuchipudi making it at once contemporary and communicative. A brilliant performer, choreographer and erudite scholar, Ananda has received much acclaim and recognition. She was conferred with the prestigious Padma Shri in 2007 by APJ Abdul Kalam, the President of India, for her distinguished service in the field of art. She was conferred with Nritya Choodamani by Sri Krishna Gana Sabha, the Kalaimamani from the Govt of Tamil Nadu and the Kalaratna from the Govt of Andhra Pradesh. She is a much sought after speaker on dance art, addressing social issues, classical arts in a contemporary society, gender issues, women studies, multi tasking, climate change and breast cancer. She brings her multi-hued talents and strengths to this prestigious conference, seeking to bring together some of the leading lights of dance together to say Dance Matters. Ananda Shankar Jayant, Director of Shankarananda Kalakshetra, Hyderabad, discusses the thoughts that went into planning the Natya Kala Conference 2009. Last year’s Natya Kala Conference 'Ramayana in Performing Arts,' was a resounding success. How has that conference influenced the way in which you conceived and organized this year’s? And yet, the year 2008, had other deep and overwhelming meanings and connotations. On July 1, 2008, I was diagnosed with breast cancer. Over the last year and more, I have been undergoing treatment, through surgery, chemo and radiation therapies. However, through it all I continued to dance. By bringing laser sharp focus to my dance, in all its multifaceted glory, I successfully Tuned out of cancer and Tuned into my dance. My dance saved me from myself! While deciding on a topic for the Natya Kala Conference for 2009, it became a natural choice therefore, to have DANCE MATTERS! as the theme of this year’s conference. Today, the whole of India seems to be dancing! Dance, in all its multi-hued presence has become a way of life. Yes, DANCE MATTERS! And it is time we bring matters related to dance centre stage. And thus this year’s conference is DANCE MATTERS! What are your goals for this conference? This year, the Natya Kala Conference, with DANCE MATTERS, as its theme, will look at dance in India over the last 60 years, and its place in the India of tomorrow. I have placed dance in a matrix, and have selected the topics, as a cross section of it. The first tier will look at the received legacy of some of Indian dance’s greatest performers, artists, scholars and minds, who have shaped and fashioned what we know as classical dance today. The second tier will take note of the changes, influences and new directions that are being drawn, imaged, imagined and presented, by different generations of dancers and thinkers. This section will look at those pushing and bursting boundaries, collaborating, striking new paths, finding new partners and parameters, and treading fresh grounds of artistry. The third tier will look at issues of maintenance, sustenance and continuance and will have panel discussions that will address issues, of livelihood and relevance, of both dancers within and outside India. The fourth tier will showcase the sweep and stretch that dance has undertaken into television and cinema, and its overriding influence thereof. The fifth tier will look at dance matters, and will highlight some issues of and for dance, like lighting, intellectual property rights, media, etc. Each day will have a special theme: Past-Present continuous, Legacy, Inner world- Outer world, New Directions and Dance Matters. What is the schedule? Who are the speakers/presenters? Many senior dancers, and renowned artists and scholars, will share their knowledge and ideas over this 6 day conference, scheduled from 26th December to 31st December 2009 from 9am to 1pm, at Sri Krishna Gana Sabha, Chennai. Purandeswari, Union Minister of State for Human Resources development, Government of India will inaugurate this year’s Natya Kala Conference, while Jayant Kastuar, Secretary, Sangeet Natak Akademi, will deliver the keynote address, on Saturday the 26th December 2009 at 9.15am. On 31st December, well known writer and critic and International director of APPAN, Shanta Serbjeet Singh will deliver the Valedictory address. The conference brings on one platform, the genius of Balasaraswati, Rukmini Devi Arundale and Vempati Chinna Satyam, the artistry of legendary and iconic performers and choreographers like Kumudini Lakhia, Chitra Visweswaran, Lakshmi Viswanathan, VP Dhananjayan and Nandini Ramani, and avant-garde and cutting edge contemporary thinkers and performers like Anita Ratnam, Astad Deboo, Ramli Ibrahim, Geeta Chandran. Frontline performers like Priyadarsini Govind, Sujata Mohapatra, share their vision. Well known dancers and gurus, A Lakshman, Gopika Verma, Deepika Reddy, Kishore Mosalikanti and Anita Guha from across dance styles come together, to converse and dialogue on dance teaching and training, and being both performers and gurus. Renowned names from the firmament of Indian dance, living outside India; Lata Pada, Ratna Kumar, Rama Bharadvaj, Srividya Natrajan, Hari Krishnan, Aravinth Kumaraswamy and Siri Rama, confer about negotiating new cultures and navigating new spaces, and intercultural collaborations. Eminent scholars like Dr. Sunil Kothari, Leela Venkataraman and Ashish Mohan Khokar, share their immense knowledge and experience. While Sadanand Menon, Ramnarayan, Anjana Rajan, Chitra Mahesh, Anuradha Ananth and Anirudhan Vasudevan look at the role and place of media in dance and dance in media, Gautam Bhattacharjee, will teach us how to light up for dance. Issues of intellectual property rights , and copyright issues in dance will be brought to light by Uttara Asha Coorlawala, Jayaprada Ramamurthy and the law firm Universal Legal. Excerpts of new works will be featured in the session Past Forward, which will feature Madhu Nataraj, Samudra, Thiruchelvam and Arangham dancers. While Radhika Shurajit, will throw light on TV, Reality shows and dance, the iconic Saroj Khan will take us through the paces of film choreography. Renowned musician Anil Srinivasan will explore Art, Beauty and Creation, with celebrated musician Unnikrishnan, film maker Rajeev Menon and mythologist Devdutt Patnaik. Saroj Khan? That’s interesting.. How come you have chosen TV and reality show dancing and film choreography? As I said earlier, today the whole of India seems to be dancing! Surf the TV any time and chances are you will see at least 3 or 4 channels airing a dance reality show! In this scenario, all dance is dance, yet there is huge emphasis on training, the body, choreography, learning, group workings etc, and is obviously very popular, and also has adequate funding and corporate support. Yet, at the same time, we all lament that there is no space/time or funds in classical dance. It sure is a paradox, and we as a community of dancers need to look the issue in the eye and address it. How do we make classical dance, popular with young adults? After all they are the inheritors of our traditions. So shows like Taka di mi tha , acquires new meaning. How do we make a niche for ourselves, competing as we do with more popular media, for attention? We need to embrace newer media, and by bringing it onto a conference platform, a new sense of direction may be triggered. Such TV shows reach a larger audience, and can be a great vehicle for propagation of the classical genre, of course if done well only! As for films, Bollywood dancing is the new superstar of dance! Any large event, anywhere in the world... Bollywood dance is a must! Eg: Last year’s Oscar nite, The Commonwealth games in Australia, the evening programs at Davos, the numerous opening and closing events of India’s tourism festivals, etc, have all had Bollywood shows! As a media with the widest reach and appeal (In India after all cinema and cricket is akin to religion), film choreography, draws very often from classical dance. The iconic Saroj Khan, who is the doyenne of film choreography, will present a bird’s eye view, of film choreography over the years. Also, her story and presence, will inspire young dancers and choreographers, to look at dance choreography in films which can be well paying, once they learn the requirements. You are also addressing issues such as collaborations, stretching the boundaries, relevance, copyright, livelihood etc. Yes, Anita Ratnam and Astad Deboo will dialogue on Collaborations, while Geeta Chandran and Ramli Ibrahim will look at stretching the classical boundaries. Diaspora dancers will dialogue on issues of relevance, inter-culturalism, navigating new spaces and negotiating with new cultures, while young gurus will discuss livelihood, training, attrition of students to academics, etc. On 31st December, I have a session on Intellectual Property Rights and Dance. This in itself is a very detailed and complicated subject. My aim is to introduce the concept, and the presently available laws on the subject, highlight the issues, problems and lacunae, and then have an indoor satellite conference with senior dancers and legal lights, brain storming on what could be formulated as a law or an act later. The plan is to take the Natya Kala Conference to its next logical step. Last year you had something for children. What about this year? Oh yes! Children are an integral part of the art scene aren’t they? They are your tomorrow’s dance stars and teachers. They will take the art forward. So I have a session titled Twinkle Toes, on 29th December 2009 from 3pm – 4.30pm which is by, of and for children. This is as part of CSR ... Which I have interpreted as Cultural Social Responsibility! So, children from disadvantaged backgrounds, challenged and otherwise abled children will watch youngsters perform different styles of dance for them. In addition to attending conferences and performances, what else must young, upcoming dancers do in order to preserve and promote Indian classical dance? For young dancers, conferences such as this are a godsend as they can learn so much. This year, matters such as dance lighting, PR, choreography, legacy, new directions are all areas, where they can learn so much. Young dancers are being offered so much on a platter. They must make use of this opportunity, and soak in all that they can! They will also have to don this mantle some day in the future, so what better way to learn? What are the challenges that young, upcoming dancers face? What are some ways in which they can overcome these challenges? I think the biggest challenge young dancers face is one of focus...and staying the course. Dance has to be approached not as a career, but as a reason for just BEING! Today young dancers want to go very far, very fast... that really doesn’t work. Soon they get frustrated, and give up. Dance is not about the number of performances one does, but about the artistry that you achieve in each one of them. Dance is not about copying the most popular diva of the day, but finding your own core strength and fine tuning that. It is after all, tradition in fast motion! Yes, there is a severe lack of funding for young dancers... yes, there are better paying jobs out there in the market... so one must go out there, and maybe find a good job to keep the home fires burning, and keep your passion for dance aloft. TED India was one of the most fantastic experiences I have had. Being one of just 40 speakers, from across the globe was indeed very special. TEDIndia’s list of speakers was an inspirational and unusual mix of people from diverse disciplines.With the theme The Future Beckons, it was the ultimate brain spa. TED stands for Technology, Entertainment, Design -- three broad subject areas that are, collectively, shaping our future. Attendees and speakers are from vastly different fields and draw inspiration from unlikely places. This was a singular honour. I learnt to speak and dance and say all I wanted to say in 18 minutes! I was speaking in the session titled Power of Stories, alongside innovator, Ramachandra Budhihal, Film director Shekar Kapur, actor Abhay Deol, and photographer Ryan Lobo. I received a standing ovation! I have tried to bring some of TED’s organisational ideas to NKC this year. On a lighter note, what is your favorite restaurant or café in Chennai? Oh, I love Cholayil Sanjeevanam, the Ayurveda food restaurant on Nungambakkam High Road. Romba healthy!! !